With warmer months come wearing shorts, skirts and lots of sandals and flip flops. So making sure my skin stays moisturize daily is always on my to do list. One of my favorite brands to help my skin stay moisturized is Jergens. So I was super excited when their new Shea Butter products came out and I had the opportunity to try them. 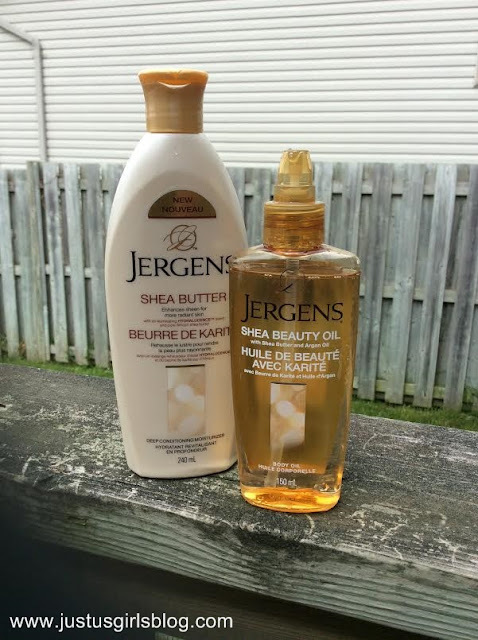 I was sent both the Jergens Shea Beauty Oil and the Jergens Shea Butter Deep Conditioning Moisturizer. Both worked amazing and had my skin looking beautiful and feeling healthy. When using any type of lotion I always make sure to lather up once I'm out of the shower. Did you know that the best time to apply lotion is right after you're out of the shower? This way your body can lock in some of the water that's on your body and use it to hydrate your skin. So that's when I used the Jergens Shea Butter Deep Conditioning Moisturizer the most. Jergens Shea Butter Deep Conditioning Moisturizer combines both a unique Hydralucence blend with African Shea Butter, which helps replenish moisture, enhance sheen and improve skin’s moisture barrier for more beautiful, radiant skin. Shea Butter is a premium ingredient known to nourish your skin, this is definitely a most moisturizer to use daily. What I loved about the Deep Conditioning Moisturizer was not only the smell, but also how it was a great thick, but not heavy, consistency that left my skin feeling vibrant and hydrated. It didn't leave me feeling greasy and gross. The Jergens Shea Beauty Oil is made with both Shea Butter and Argan Oil and is designed to designed to quench, hydrate and condition skin of all types. This body oil can also be used after showering since it gives your skin six times more radiance, sheen and hydration.. When I wasn't using the Deep Conditioning Moisturizer after my showers, I was using the oil, which hydrated my skin better than most body oils I've used before in the past, which was awesome and had my skin glowing. I loved that the body oil was very light when applying and absorbs really fast, leaving you with a happy results. Both products have definitely become two of my favorite skin products to use. Since we here in Canada get really harsh Winters, using both the Shea Beauty Oil and Deep Conditioning Moisturizer will definitely be a must to help keep my skin hydrated during the cold months. Both products retail for $10.99 and can be found at most stores. For more information about these products and other products from Jergens be sure to head to www.jergens.ca. Disclosure: All opinions are my own. I received Jergens Deep Conditioning Moisturizer and Shea Beauty Oil at no cost for the purpose of this review. No other compensation was received.